The next time you’re having a fall or winter dinner party and one of your guests is a vegetarian serve this main course as part of your dinner menu. TIP: don’t be surprised when everyone wants to try it, and then asks for the recipe. 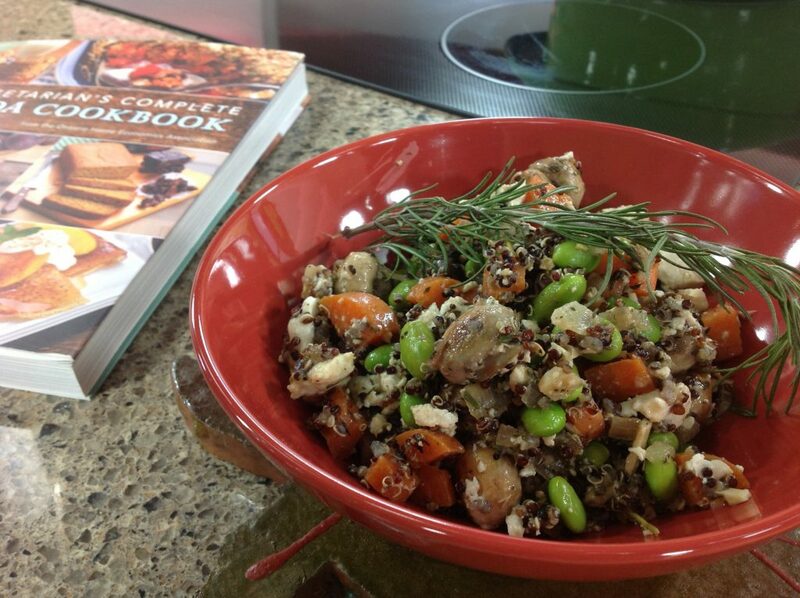 Place quinoa in a small pot, add water, and bring to boil, cover and cook over medium/low heat for 15-18 minutes. The quinoa is done when the grains are translucent and all of the water has been absorbed. Fluff with fork, remove from heat and let stand covered for 5-10 minutes. Add onions and garlic and lightly sauté until lightly browned, approx. 3-5 minutes. Add carrots, thyme, rosemary, and cracked pepper. Stir well. Add ¼ cup (60 mL) broth, cover, and cook for 3-5 minutes, stirring occasionally. Add frozen Edamame and stir until they turn a bright green. Stir in cooked quinoa. Crumble the goat cheese in and gently mix. Add the rest of the broth (1/4 cup/60 mL) Stir in, cover, and reduce heat to low. Cook for 3-5 minutes or until the cheese has melted and the Edamame are cooked through.